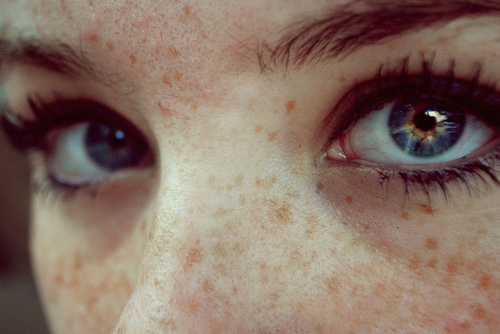 If you have freckles, you are a lucky person! It’s rare to see people with freckles, at least in the African and Asian countries. Freckles are clusters of concentrated melanin which are most often visible on people with a fair complexion. A freckle is also called an “ephelis”. Is one genetic “treasure” and are predominantly found on the face and in other areas of body. You should use sunscreen and, in sunny days, you should avoid products with peeling and exfoliating agents to prevent skin patches and hyperpigmentation of the skin. Exists two types of makeup for people who have freckles: disguise or highlight them. In my opinion, you should highlight and not disguise them, but if you want to disguise, you should use concealer with high coverage and a foundation with high coverage too. After that, use a blush to look healthier and highlight your eyes. For your makeup last all day, use a good primer (for face and eyes) and a good compact powder. To highlight your freckles you should use tones as grey, black and pink, basic colors that do not match the freckles, the main tip for highlight them. But if you want, you can go further and extend your color palette. The people who have red freckles can use shades of bronze blush. The people who have brown freckles can use shades of peach and coral blush. Another tip is highlighting your eyes. Use and abuse of your favorite mascara, as a perfect shadow for your eyes, but the Universal shade is the sparkling brown, looks good in everybody. If you have dark circles, use one illuminator/concealer and one beige eyeshadow to the inner corner of the eye, in order to disguise the dark circles. For lips shine, use one lipgloss/lipstick in red/orange shades if you are redhead, pink/lilac shades if you are blond, red/pink shades if you are brunette and red/brown shades if you are dark. Small trick: If you have round face and want to tune it, do contour in your face with bronzer or blush without glitter. I will talk more about this topic in my next posts. As you can see, it’s easy highlight or disguises your freckles. Whichever your option, I hope you like the final results! For you who has freckles: What are your favorite tips? Do you have others tips beside these? Tell me everything in comments below!